The Immersion Presents team has arrived in Greece. We're joining a scientific expedition that has been going on for more than a month. During this part of the expedition, scientists will be studying the a volcanic eruption that happened about 3600 years ago on the Greek island of Thera. They will be using remotely operated vehicles (ROVs) developed by the Institute for Exploration to look at volcanic materials on the seafloor. They want to understand better what happened during the ancient eruption. 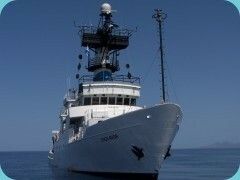 We are using a ship called the R/V Endeavor, which is operated by the University of Rhode Island. During the two-month expedition, the Endeavor will cross the Sea of Crete, the Aegean Sea, and the Black Sea. You can read background information about all the segments of this expedition and some reports from the scientists so far. It takes lots of people to make an expedition like this happen -- scientists, engineers, ship's crew, and more. The people on this expedition traveled here in different ways, depending on their job. The ship's crew drove the ship all the way across the Atlantic Ocean starting in March. Many of the scientists met the ship when it got to Europe in April. The team that produces the live Immersion broadcasts got on the ship in Turkey a few days ago. They set up their equipment on the ship while sailing to Greece. Finally, I joined the team when they arrived at the island of Thera. There are so many people involved that there aren't enough beds on the Endeavor for us all to stay on the ship at night. Most of the scientists sleep on the ship. So does the crew and the engineering team that operates the ROVs. This allows them to do science 24 hours a day. Some of the scientists sleep while the others stay up and work. Then they switch. The periods during the day when they work are called "watches." The production team spends the night on Thera. We take a boat from the island to the ship each day. The same boat brings us back each night. The boat trip takes about a hour each way. While we were on the ship yesterday, the Immersion team practiced setting up for the live broadcasts, which begin June 3. They'll be doing the same today.